This is a comnpendium volume of three Battle Summaries or Naval Staff Histories produced soon after the war by the Naval Historical Branch of the Admiralty. Originally classified and designed for internal use only, these histories are published here for the first time. The documents in this book cover the actions during the period 1939-1941 that resulted in the sinking or immobilising of the German Warships Birsmark and Graf Spee, and record the struggle to rid the seas of the menace of the armed merchants raiders. Frank Cass is reprinting Admiralty Naval Staff Histories under the general editorship of the Head of Naval Historical Branch. 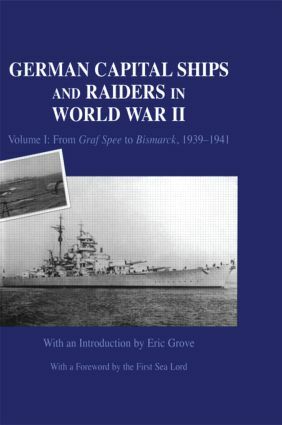 German capital ships and commerce raiders are covered in two volumes, from Graf Spee to Bismarck, and Scharnhorst to Tirpitz. These Second World War operational reports, written by the Navy for the Navy, are a primary resource for historians. "meticulously researched and records the naval events for the first time. In the light of the current problems of illegal immigration from the sea taking place in various parts of the world it is extremely relevant today. Recommended"